Sarathchandra Jayawardana needs no introduction. His latest publication, Atlas of Historyspeaks well of him. As students we were familiar with Atlas. But in our mind Atlas is a collection of various maps of the earth or a specific region on the earth. The maps in atlases show geographic features, the topography of an area's landscape and political boundaries. They also show climatic, social, religious and economic statistics of an area. Atlas is a book of maps and charts that helps one to locate a place. It is Geography. When I came across an Atlas of History I was ruffled. When I opened the book I was mesmerized. History is something which never stops at a point. It always moves with ticking time. With the moving history faces, features, landscape, structures, nature and everything changes. After a lapse of time one would not see anything as was seen a time ago. It is nearly impossible to map a history. The Historical books such as Deepawamsa, Mahawamsa and Chulawamsa are mostly contemporary records of the history. But recording history with a map and a photograph after several millenniums is unique and a near impossibility. The Atlas of History is a first in that sense. It is not this impossibility merits reading Sarathchandra Jayawardana’s Atlas of History. It is the content what matters. This Atlas contains a brief description of events and civilizations. When we were studying History not only in the school but also in the University we hardly had a clue of locations. That gap is filled by this Atlas. Atlas explains an event, a place, a civilization with a map and a picture. We have read and studied changes taken place throughout the history. But we find difficult to locate the exact place where an event took place as they were not mapped. Jayawardana has done it. Creating a map or a picture of a place existed in the History many millenniums ago is a mixture of geniuses, creativity, imagination and combined knowledge of history and Geography. History always comes in volumes. We spend many nights to read and grasp it. But one can grasp the history in few minutes through the Atlas of History. The Atlas of History provides a clear picture of rise and fall of world empires and old civilizations. The Atlas starts with the origin of the Solar System and the Earth and comes to origin and evolution of the man. 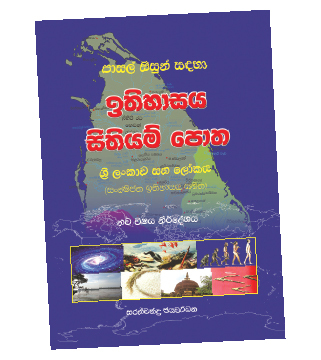 Sarathchandra Jayawardana has covered a history of several millenniums with the origin of Solar System and earth, the evolution of the man, rise and fall of empires and the whole history of Ceylon (Sri Lanka) just in 108 pages with brief write-ups, pictures, maps and illustrations in a simple language mustering his long experience and skills. Atlas is produced in user friendly manner and the author has highlighted a few difficulties encountered in producing the Atlas. He says that certain names of places have changed over the time and many times. Features, landscape, land marks have changed. The author had to recreate the events and rebuild the history and depict it through an Atlas. Yet, he has produced the Atlas with minimum distortions. He states the Atlas is focused on school pupils and teachers. My school days go back to more than 50 years. But there are some historical events I did not grasp well. Sarathchandra Jayawardana’s Atlas cleared all that. It is not proper if homage is not paid to Sarasavi Publishers who are always behind publishing a worthy book for the society. I recommend this atlas to teachers and students and any reader who is interested in learning a long years of history in a few hours. The Atlas is useful to Historian as well as to Non historians. It is useful to teachers as well as to pupils. It is useful to young and old. Atlas of History is a snapshot of the long winding History.